The centrifugal fan is one of the most widely used fans. Centrifugal fans are most commonly used in industries and well-suited for industrial processes and air pollution control systems for moving air or other gases. These fans increase the speed and volume of an air stream with the rotating impellers. They are sturdy, reliable, and capable of operating over a wide range of conditions. Centrifugal fans use the kinetic energy of the impellers to increase the volume of the air stream, which in turn moves them against the resistance caused by ducts, dampers and other components. Centrifugal fans displace air radially, changing the direction (typically by 90°) of the air flow. The distinctive features of a Centrifugal fan is that it is a constant displacement device or constant volume device, meaning that, at a constant fan speed, a centrifugal fan moves a relatively constant volume of air rather than a constant mass. The air velocity in a system is fixed even though the mass flow rate through the fan is not. The centrifugal fan is a drum shape composed of a number of fan blades mounted around a hub. The hub turns on a driveshaft mounted in bearings in the fan housing. The gas enters from the side of the fan wheel, turns 90 degrees and accelerates due to centrifugal force as it flows over the fan blades and exits the fan housing. 1. air volume that will be required in cubic feet of air per minute (CFM) or the metric equivalent, cubic meters per hour (M³/Hr). 2. Static pressure resistance through the complete system which is rated in inches water gauge (in WG) or the metric equivalent, millimeters water gauge (mm WG). Note : WG or mm WG is the resistance to flow, or friction, caused by the air moving through a pipe or duct. However it is important to include other items such as filters, dampers, heat exchangers, etc. 3. The temperature of the air going through the fan and the ambient air temperature outside the fan. 4. Type of air stream be clean, dry air and any corrosive substances in the air. 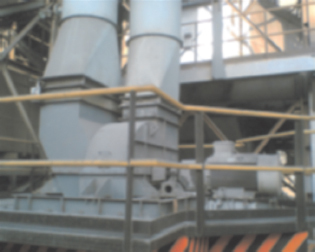 • Conveying material in dust collector systems or loading to silos, trucks and railroad cars. • Combustion air for burners and industrial boilers. • Cooling electrical equipment or parts from heat curing ovens and kilns. • General ventilation of rooms or factories. • Providing suction or pressure for industrial process air. KARYASIDDHI offers the widest range of Centrifugal Fans and Blowers and is the preferred choice of customers due to its robust construction, quality, build, performance and low energy consumption. These Fans are extensively used by customers from FMCG, Chemicals, Fertilizers, Food, Steel, Metals and all major industries.